With a terrific build quality and a classy finish, the device feels quite solid in the hand and would look awesome anywhere. Its fresh design is something most would love to flaunt even in the most glamorous environment. With a non removable back, the device boasts of dualism along with MicroSD slots on its right hand side, covered by flaps. Both MicroUSB port and 3.5mm headphone jack port are as usual on the top and the single microphone at the bottom. In the rear are the LED flash, 8MP primary camera and the speaker unit. Music lovers will be slightly disappointed with the very average bottom firing loudspeaker with inevitable distortion at high volumes. 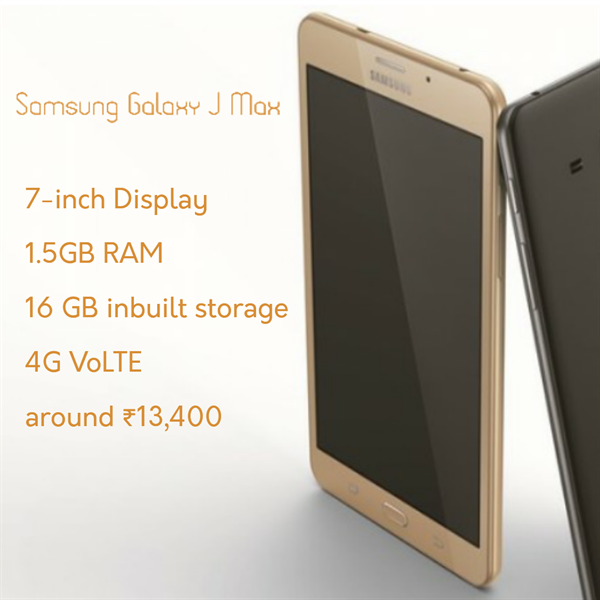 Unlike other J series units, the device lacks a sAMOLED panel, but boasts of a gigantic 7-inch WXGA TFT display along with a physical home button and two capacitive buttons for back and recent apps below the display for smooth working. With a resolution of 1280 X 800 and pixel density of 216ppi, it may make many not taking to its neutral and realistic colors and miss the vividness of an AMOLED panel. With an average display, low resolution and a manual brightness sensor, many might wish for good old models. But its sheer size adequately balances flaws and makes it terrific for those wanting predominantly media consumption. Running on Android 5.1 Lollipop and powered by 1.5GHz quad-core processor and 1.5 GB RAM along with 16GB built-in storage, the unit can easily support extra storage of about 200 GB via micro SD. It's disappointing to see the unit using Cortex A7 which has almost become obsolete in the smartphone world. Capable of supporting 4G with VoLTE support, Bluetooth, GPS and Wi-Fi, the unit has every feature you can name in its kitty. Unfortunately, the unit lacks an ambient light sensor, haptic feedback and secondary noise canceling microphone which is fast becoming a Samsung mainstay. However, its Mali-400 MP2 GPU makes it the modern day dinosaur. The mediocre camera produces just about decent photographs which under testing conditions becomes grainy and muddy. Multi-window facility, a de-cluttered and simplified TouchWiz are other features inculcated. No doubt the battery life and its stellar visual appearance is highly appealing, but its bid to classify itself as both a smartphone and a tablet leaves it suffering from 'identity crisis'. Priced approximately at around ₹13,400 INR, the device is great for content consumption and those desperately needing a long battery life. Left hanging between the ultra modern and the obsolete, it remains to be seen if the device manages to catch the fancy of the smartphone buffs. This article will help you to unlock your Samsung Android Phone, in case you forget its pattern and it remains in locked state. This method requires no particular skills. Read more! Are you looking for the best Android phones from Samsung? Read my experience in searching for the best Samsung smartphone with Android 4.0 ICS Sandwhich OS. Read the review of the Samsung smartphone Rugby Smart along with all the features and specifications on the mobile. Know what are the pros and cons of this Samsung Rugby Smart and all about the cool features and price of this smartphone.